All about the new data protection rules with Webmecanik! The General Data Protection Regulation (GDPR) is the new legislation that provides European citizens control over their personal data. Le Règlement Général pour la Protection des Données est la nouvelle législation qui offre aux citoyens européens, le contrôle sur leurs données personnelles. Officially since May 25, 2018, this rule is intended for all European organizations that process or store personal data. This also applies to third parties such as data hosting companies. Failure to comply with the GDPR may result in a fine of up to 4% of turnover or € 20 million. What are GDPR distinctions between B2B and B2C? GDPR applies to companies in B2C or B2B based on the same principles indistinctly. In terms of commercial prospection by email, a distinction is nevertheless present on the consent (opt-in) of the person. In B2C, no commercial message is tolerated without prior agreement of the recipient. While in B2B, the recipient must be informed and must have the opportunity to object at the time of collection and to later to rectify it. Si vous faites parti de l’Union Européenne ou que vous collectez et/ou traitez des données de résidents de l’UE, vous êtes alors concernés par le RGPD. Dans ce contexte, les premiers visés sont les équipes marketing et commerciales qui collectent des données de prospects et clients et s’en servent pour prospecter et développer l’activité de l’entreprise. Webmecanik is a pioneer in GDPR compliance for marketing automation software. We have well before May 28, 2018, put in place the necessary actions to the compliance. Moreover, our suppliers are too. Thus, by choosing Webmecanik you make sure to select a compliant supplier, which will help you in your own compliance process (and we provide you with a contract for proper data outsourcing). Is a marketing automation software GDPR compliant in the first place? Careful: this will depend on three important points. First, you need to make sure that the solution itself respects the GDPR, and this is not the case for all softwares. You are obliged to choose a supplier GDPR compliant if you want to respect it yourself. Then, the software must provide you with all the features necessary to respect the GDPR rules (data anonymization, right to be forgotten, etc.). If certain technical rules are not respected, it is lost in advance. Finally, it also depends on your use. If the use you make of it does not respect the good practices, it is done for! 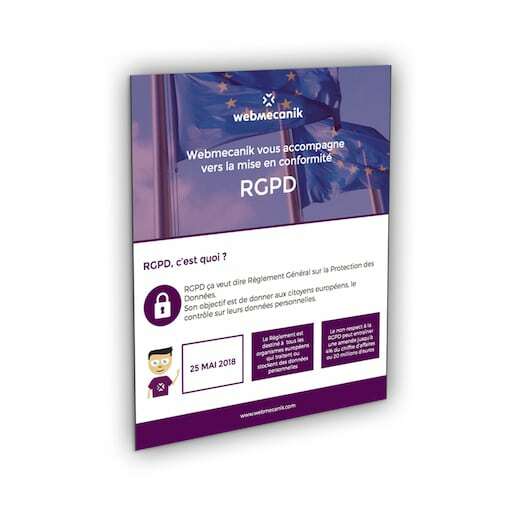 But do not panic on this point, Webmecanik experts have a training module dedicated to GDPR compliance of your marketing team. We put at your disposal resources to better understand GDPR in your inbound marketing and marketing automation strategy. Are your emails GDPR compliant? The General Data Protection Regulation (GDPR) was enforced on May 25, 2018. Since then, a certain number of actions have been put in place in your company to comply with the new regulations. Your marketing initiatives must also be modified to respect your visitors personal data. But what are these changes? Emailing is part of your marketing strategy, so discover all the actions you need to update to be GDPR compliant. The General Data Protection Regulation (GDPR), was enforced on May 25, 2018 and you must bring your marketing and webmarketing service into compliance. The subject is very vast and can seem complex. That's why Webmecanik created a 100% GDPR offer to your business. A package with software & training, an approved methodology and a simple tool to answer all these obligations (right to be forgotten, right of rectification, consent, center of preferences, opt-in, cookies acceptance, legal notices update, etc.). In accordance with the General Data Protection Regulation, Webmecanik SAS allows all persons to have their right of access to the data concerning them and have it rectified or deleted.